We’d love your help. 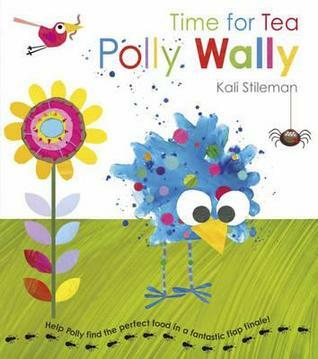 Let us know what’s wrong with this preview of Time for Tea Polly Wally by Kali Stileman. With her bright, bold and colourful artwork, Kali Stileman has created a book about food to rival Eric Carle's The Very Hungry Caterpillar. This is a warm, funny story that introduces animals and food types with a fun surprise, revealed when the fantastic flaps are lifted. Kali's first book, Peely Wally, was selected to be part of the Booktrust's Books for Babies scheme. 15 With her bright, bold and colourful artwork, Kali Stileman has created a book about food to rival Eric Carle's The Very Hungry Caterpillar. This is a warm, funny story that introduces animals and food types with a fun surprise, revealed when the fantastic flaps are lifted. Kali's first book, Peely Wally, was selected to be part of the Booktrust's Books for Babies scheme. 150,000 copies will be distributed to mothers and babies throughout the UK in 2012. To ask other readers questions about Time for Tea Polly Wally, please sign up. Polly Wally has a problem. She’s hungry, but can’t find anything nice to eat. Colourful and comical illustrations accompany this appealing story about a hungry little bird hunting her perfect food. Finally, hidden under leafy flaps, just asking to be opened by tiny fingers, Polly Wally finds the tastiest snacks. A little while ago we got a book called Peely Wally out of the library, which we loved, so when we got the next book Polly Wally we were super excited to start it! We were not disappointed, the bright, bold, colourful and fun illustrations are a real treat. The simplistic storyline if perfect for little ones, there are parts of it that are repeated quite a few times throughout the book, which I think is brilliant for little ones who like to try and read the book back to parents from their memory A little while ago we got a book called Peely Wally out of the library, which we loved, so when we got the next book Polly Wally we were super excited to start it! We were not disappointed, the bright, bold, colourful and fun illustrations are a real treat. The simplistic storyline if perfect for little ones, there are parts of it that are repeated quite a few times throughout the book, which I think is brilliant for little ones who like to try and read the book back to parents from their memory (like my daughter). So the bits that are repetitive are so easy for her to remember. Polly Wally is a real winner and has easily made it onto my daughters favourites shelf. Little Polly Wally is a baby bird with a big rumbley in her tummy! She goes in search of something to eat for her tea. She sees lots of different animals who offer her some of their favourite things to eat, which are yuck! What is poor little Polly Wally to do? She really is ever so hungry! The ending will put a huge smile on your face. This book is a super-cute read that works out well for everyone in the end. On every page there are tiny little bugs which are fun to go back and let your kids find and discover on their own. I can highly recommend Polly Wally!